When the Republic of Belarus joined the Ramsar Convention in 1999 (as a successor to the Soviet Union), it designated the freshly established Sporovsky Biological Reserve as its first Ramsar Site. This sedge fen in the middle course of the Yaselda river is a biodiversity hotspot and one of the largest breeding areas for the globally threatened aquatic warbler Acrocephaus paludicola, a Eurasian-African migratory bird for which an international conservation agreement was signed in 2003 under the Convention on Migratory Species (CMS). 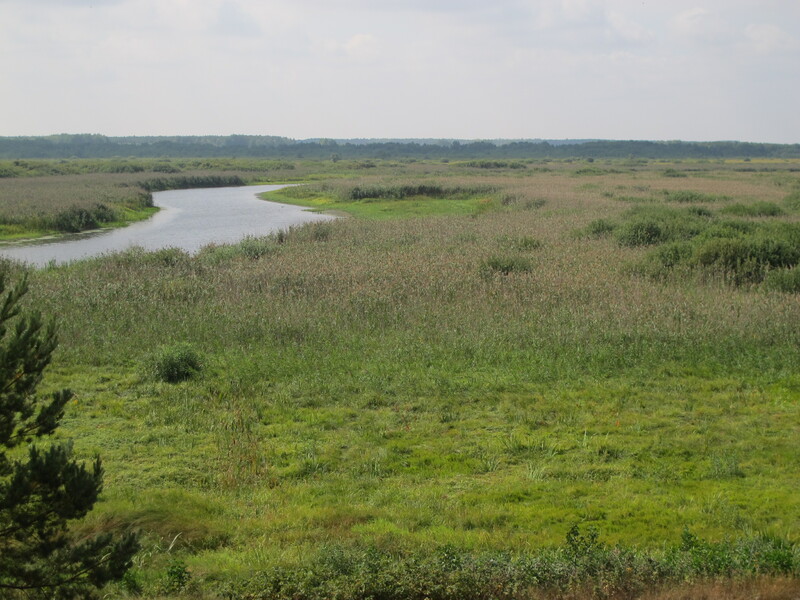 In 2000, a British-funded project by the BirdLife partners in the UK and Belarus started with specific studies on the habitat requirements of the small bird, leading to the development of a first management plan for the Ramsar Site. During the Soviet time, the hydrological regime of the mire was disrupted by a system of drainage channels. After the collapse of state farming in the 1990s, human use with intensive cattle grazing and grass cutting was abandoned, leading to overgrowth of with Salix bushes and the degradation fo the open fen habitat which the aquatic warbler requires. During recent years, the understanding grew that the drained mire was no longer accumulating dead plant material as peat, and thus no longer storing carbon, but increasingly emitting greenhouse gases (CO2, N2O, CH4). To restore the peat-accumulating mire ecosystem, the area needs to be rewetted by blocking the drainage ditches and increasing the water level in the floodplain. This reduces carbon emissions into the atmosphere and contributes to carbon storage in the peat soil. Activities that correspond to the objectives of the European Union-funded Clima-East project (2014-2018) to strengthen the climate change adaptation capacity through the conservation and wise use of peatlands. Furthermore, cutting of the invasive bushes and shrubs is needed to maintain the open mire ecosystem. Using the removed biomass as a fuel for new combustion plants, produces climate-neutral energy that can increasingly replace Belarus’s dependence on Russian fossil fuels. This is the innovative socio-economic approach that is currently developed through an ecosystem-based project in the Sporovsky mire. On 25 August 2015, peatland and climate specialists from Belarus, the Russian Federation and Ukraine (with additional experts from Germany and Thailand, including Ramsar’s Focal Point Ms Nirawan Pipitsombat) gathered in Minsk, the capital of Belarus, for a Clima-East workshop to share experience in peatland management and greenhouse gas monitoring, to learn about the current state of monitoring methods for peatlands, and to discuss common challenges for the ecosystem-based approach. 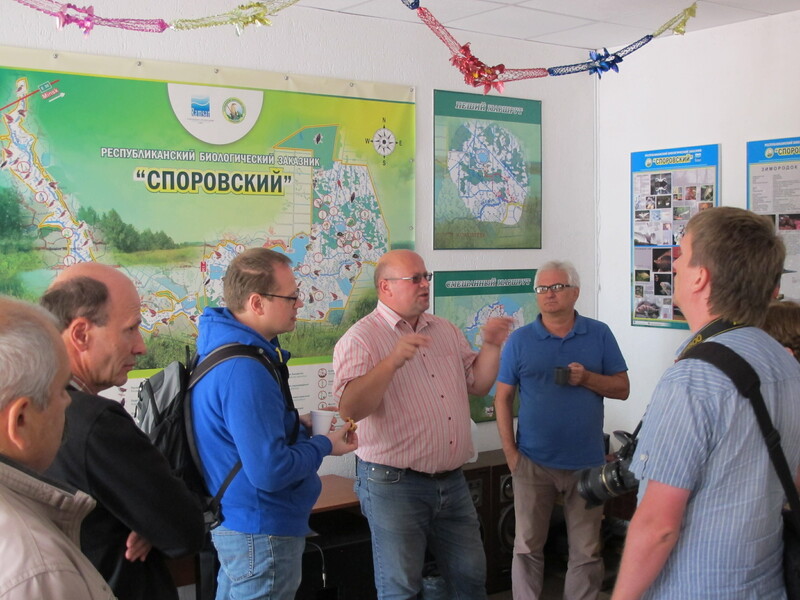 And the following day, they visited one of the pilot projects of the project – the Sporovsky Ramsar Site. And through their visit, and the explanations received in the new visitor centre in Visokoje village (established with help of the Global Environment Facility and UNDP), they learned about the story how the tiny bird triggered a project to restore its wetland breeding habitat, to reduce greenhouse gas emissions and to replace fossil fuel with wetland biomass for energy production in Belarus.